Jimmy Kimmel, who hosted the Oscars on Sunday night, has responded to President Donald Trump’s tweet about low Oscars ratings. On his show Tuesday night, Kimmel said every big televised event had dipped in ratings since Netflix emerged. Jimmy Kimmel, who has gained a reputation for speaking out against President Donald Trump, has now addressed the president’s tweet about low Oscars ratings. Trump on Tuesday tweeted about Sunday night’s telecast, which was the lowest-rated in Oscars history in Kimmel’s second straight year hosting. “Problem is, we don’t have Stars anymore – except your President (just kidding, of course)!” Trump tweeted. Lowest rated Oscars in HISTORY. Problem is, we don’t have Stars anymore – except your President (just kidding, of course)! 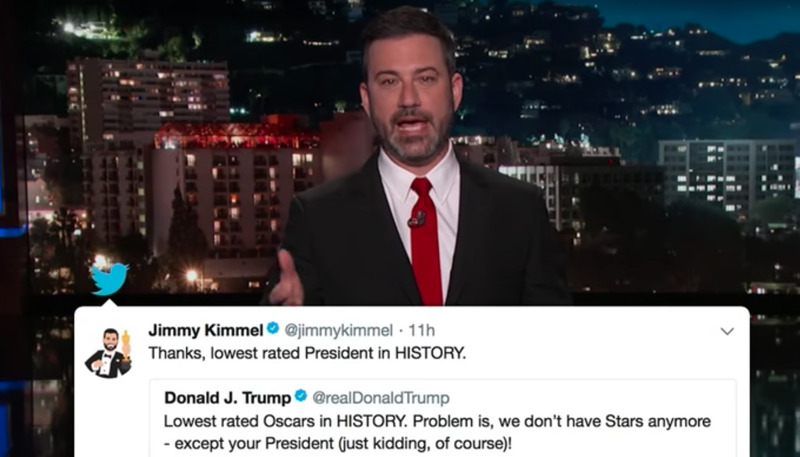 Kimmel tweeted back at Trump with, “Thanks, lowest rated President in HISTORY.” But that didn’t stop him from addressing Trump on “Jimmy Kimmel Live!” on Tuesday night as well. Ratings for last month’s Super Bowl were down 7% from the previous year’s, and the Grammys in January saw a 24% ratings decline from 2017.